A solution to keep your colors fresh while tattooing. A PREVIEW OF OUR NEW KEEP IT WET LABEL AND BOTTLE. We will begin shipping in November. Formulated by our ink mixing team, Keep It Wet is a multipurpose additive. It is CLEAR and will not alter the hue of the ink. As the name implies, now you can keep your cap of ink wet as you tattoo. Add a drop or two of Keep It Wet into your ink cap to prevent the ink from drying from evaporation. If your ink begins to dry out in the cap, refresh your ink with a drop or two. Looking for smoother transitions and washes? Add more drops to your cap as you dip to dilute the opacity of your pigment. Keep It Wet will NOT change the color, only dilute and thin the pigment. 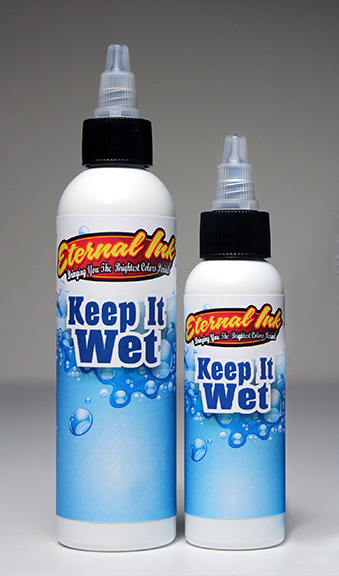 With Keep It Wet, you can achieve softer transitions on all your gradations. Available in 2 oz and 4 oz bottles.